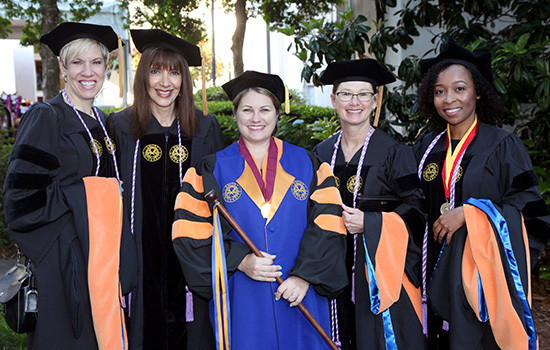 Four of seven of the nursing school's first DNP graduates, with faculty member Carolyn Clevenger in the center. The Woodruff Health Sciences Center's three schools respond continually to help tomorrow's physicians, nurses, public health practitioners, physician assistants, physical therapists, genetic counselors, and other allied health professionals meet current and future needs. In addition to its curricula for medical and allied health students, Emory School of Medicine has the country's seventh-largest residency training program (also called graduate medical education, or GME), with responsibility for licensing close to 1,300 residents and keeping up with 14 affiliated training institutions, including Grady Hospital, Atlanta VA Medical Center, Children's Healthcare of Atlanta, Shepherd Center, and many remote clinics. GME leadership at Emory served recently on a task force of the national Accreditation Council for GME to refine work hour requirements that maintain weekly duty hour caps for residents and give residents time for self-care. The medical school's most recent annual Medical Education Day, featuring workshops from colleagues from medicine, nursing, public health, and Emory Healthcare, likewise focused on cultivating wellness and balance and reducing stress. The Nell Hodgson Woodruff School of Nursing currently has the largest student body in its history and recently welcomed the first students in its Doctor of Nursing Practice Nurse Anesthesia track, preparing students to ensure patient safety and comfort from pre-operative assessment through recovery after surgery. The Rollins School of Public Health recently established an Office of Evidence-Based Learning to foster scholarship on effective teaching techniques and disseminate best practices in instructional methods to faculty and doctoral students. In response to inquiries, the school also began offering an accelerated joint degree program, in which students pursuing doctoral-level professional education outside Emory can enroll in Rollins on a dual-degree format. ■ Emory Healthcare provided $125.2 million to support teaching and research missions in the Woodruff Health Sciences Center in fiscal year 2016-2017. ■ The Woodruff Health Sciences Center invested 24.2.% of its tuition income last year in financial aid for its students, an amount totaling $27.9 million.